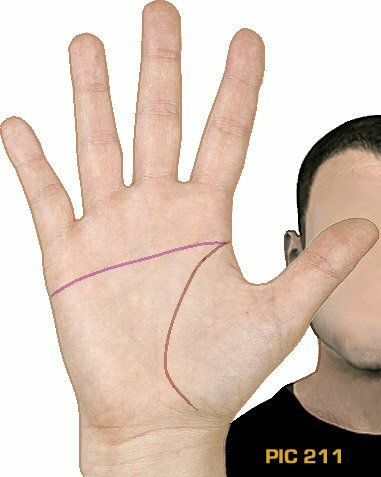 HAND LINES - The PIC-MODEL: 21 typical palmar crease formations! The 'PIC model' describes 21 typical formation variants in the 3 'primary palmar lines' (life line, heart line and head line), founded on 3 key-apects in the evolution of palmar creases. The fundamentals of this model are explained below + the introduction of: a 'family tree' of the hand lines! Evolutionary studies have pointed out that a typical human hand line formation includes the presence of three 'primary palmar lines' that are featured with a curved, oblique appearance that do not cross the full palm. Another typical feature is the presence of one single connection between two of the three lines - usually this connection is found at the radial side of the palm: with the head line connected to the life line. But a pattern with no connections at all between the three 'primary palmar lines' is also fairly common. Despite the fact that this knowledge has been known over the past few decades, palmists nor scientists have been able to find broad common agreement about how to describe the typical combinations of the three 'primary palmar lines'. The classic palmistry literature has traditionally been focussed on the interpretation of the major and minor characteristics of the individual lines. "The simian-crease-oriented system of palmar crease formulation dominated the screen for quite a long time and the exact description of what may be included under the term simian crease has been tried by several workers." - (2) the number of intersections/connections between those lines. Despite this interesting results, the 'transversal' aspect was a missing key-factor in the Chinese model, so for example the so-called 'Sydney line' was not recognized to be significant feature - which dozens of scientific studies have pointed out the signficance of that variant of the proximal palmar crease (the 'head line'). By the way, the details of the Chinese model are described in the section scientific classifications of the major hand lines. The 'PIC model' was developed by adopting the 'transversal' aspect (3) into the 6 categories of the Chinese model, resulting in 12 basic types of 'primary palmar line' formations - but 5 of the 12 basic 'PIC model' types can manifest through multiple variants, resulting in 21 formation types for the classfication of the 3 primary lines. Each PIC type can be described with a 3-digit 'PIC code' (the most common type is: '310' = 3 primary palmar creases with 1 connection, none of the lines 'transveral' the full palm); and the types with variants are also featured with an additional 'letter' (a, b, c, d, e, or a combination of no more than two letters). More details are described in the picture below + the additional notifications. • C - Complete transversal primary lines [varies from: 0 to 2]. PS. Additional options for classification (including: large 'interruptions', 'splittings', and the missing of a 'curve') are presented in the advanced version of the 'PIC model'. • NOTIFICATION 1 - Only the features of the core of the three major palmar creases (including: the life line, heart line, and head line) should be used to classify a hand; this implicates that minor characteristics and minor lines should be ignored compeletely; and splittings should be analysed very precisely: does it concern a splitting of a minor line from the core (which should be ignored), or a splitting of the core. One can use the palmistry chart of the most common palmar lines to find and identify the core features. • NOTIFICATION 2 - A common complication concerns the presence of a "bridge" (and/or connecting lines) between the heart line and the head line. The quality of a "bridge" and/or a connecting line usually differs from the quality in the core of three 'primary palmar creases'; and if so: then the "bridge" is not a part of the core aspect of the heart line, nor the core aspect of the head line - resulting in that it can be ignored completely. But if the structure of the "bridge" doesn't really differ from the core of the heart line/head line (this can only be the case when a "bridge" runs smoothly into the heart line and/or head line), then the hand should be classified as one of the 'simian crease'-variants (see notification 5: there are six options available to make a classification in such cases). - b+c = combination of b + c.
• NOTIFICATION 4 - Each of the 21 'PIC model' types can be classified in a least one of the 8 'PIC model groups': group A to group H (the 5 complex sub-types that are featured with 2 letters can be classified under 2 groups - see the stars below: * ** *** **** and *****). 101, 200, 201, and 211. 311c, 311d, 311e, 321c, 321d. 312a+d**, 312b+c***, 322a+d****, and 322b+c*****. 200, 201, 300, 301a, 301b, and 302. 311c, 311d, 311e, 312a+d, and 312b+c. NOTICE: PIC type '101' is probably the most rare of all 21 PIC types: all three 'primary palmar lines' are fused into 1 single line! NOTICE: PIC type '300' is the 2nd most common of all 21 PIC types; it can be observed in about 8% of men in both hands, and in about 16% of women both hands can be classified as PIC-type '300'! NOTICE: PIC type '310' is by far the most common of all 21 PIC-types; in about 50% of men, and about 40% of women both hands can be classified as PIC-type '310'! 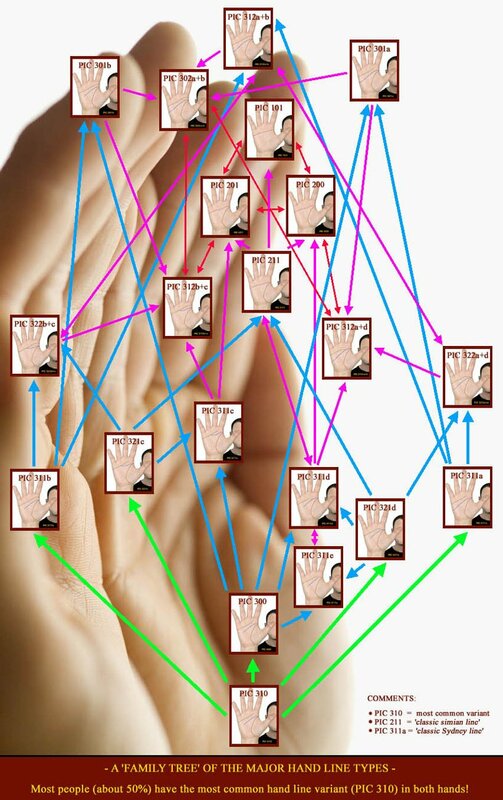 Basically the 'family tree' illustrates how various hand line variants are evolved from what has been recognized as the most common variant: 'PIC type 310' - about 50% of people have this variant in both hands! The colors of the connecting lines illustrate at what stage a PIC type is connected with the most common variant (Green = 1st stage; blue = 2nd stage; purple = 3th stage; and red = 4th stage). In general, the variants at the highest stage - indicated by the red arrows - belong to the most rare types (these are all seen in about 0.1% of the general population or less). PICTURE: A 'family tree' of the 3 major hand lines!